Gareth Paddison started his second round today in red hot form and played his first nine holes in five under par. 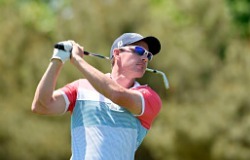 A solid even par second nine and a round of 67 gave him an eleven under par total at the halfway mark and a five stroke lead over his nearest competitors, rookie professional and Muriwai member Mark Hutson and amateur Dan Hillier. Paddisons rounds have been remarkable due to the very difficult conditions with strong winds and squalls of rain sweeping across the course. Tied for fourth place on five under par are Dan Pearce and Kerry Mountcastle with James Anstiss keeping in touch with a round of 67 today to be at four under. Josh Geary who won last week at Akarana is next on three under par.